It’s finally time to get Fallish up in this new house. And, considering I haven’t posted many pictures of the new house at all, it’s about time y’all saw some glimpses of it, huh? Here is my 2015 fantel! (Fantel = Fall mantel, in case you haven’t heard.) You can check out my past mantels, chrantels and fantels right here. Every day for the past month as I sat in my living room nursing this newborn, I would stare at my mantel and try to mentally decorate it for Fall. Since my hands have been full (literally) I didn’t think I’d decorate my mantel this year at all. But, I finally caught a break where she took a 3 hour nap right when the sun was finally shining in the right spots of my house, so I shoved aside all the spit-up rags and dirty diaper pails and threw this mantel together real fast before she woke up. Trust me when I say that my living room does NOT look like this all the time. Heck, just minutes after these photos were taken all the baby paraphernalia piled right back up almost instantly. But for one glorious moment the heavens opened and the Autumnal Angels sang, and I was able to take these pics for you guys this year. It’s what I love doing the most, so I’m very happy to finally get back to decorating and blogging after a long dry spell. I hope it inspires you! 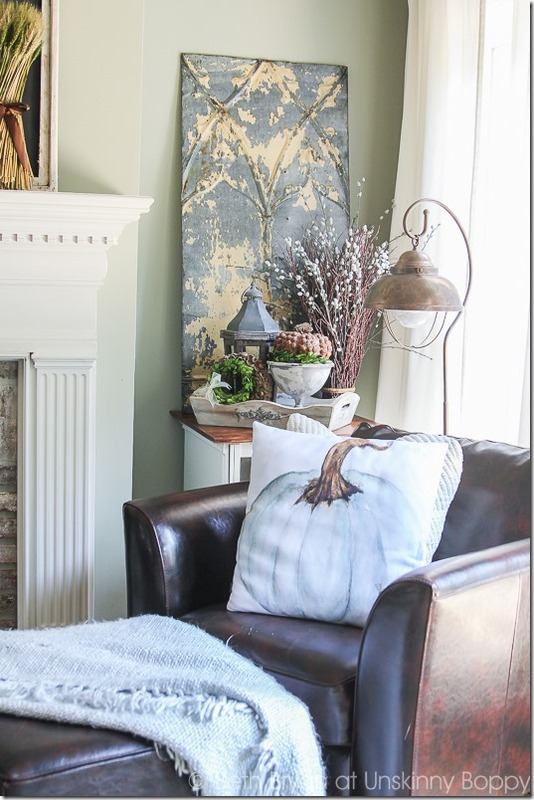 With this post I’m joining my fellow bHome bloggers for a 2015 fall home tour. They graciously let me join in the “home tour” even though this is just my mantel. But, if you want tons more inspiration for decorating other parts of your home, be sure to stop back by here tomorrow where I’ll be linking up to ALL 30+ of their posts for your perusal. I will be sharing more than 30 links to amazing decor, crafts and recipes right here in one place. We are excited to have Decor Steals sponsor this event. We will be giving away five (5) coupon codes each good for $100 at Decor Steals. There will be 5 winners! Winners will be contacted on or about 9/19. Download the bHome at www.bHome.us and “favorite” Decor Steals – to do this just give their star a tap. Once favorited you will receive a message with the link to enter. One TAP of that link and you are entered! If Decor Steals is already a favorite of yours on bHome just look out for the message and TAP to enter. While you’re there, I’d be honored if you’d give my blog a “favorite” tappity tap as well! Good luck, everyone, and happy fall! Wonderful mantel decor. Thank you for sharing. 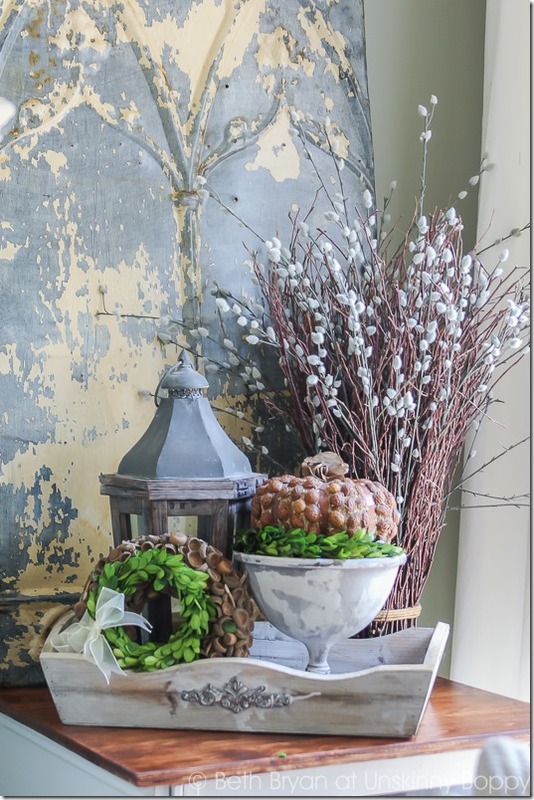 I’ve recently discovered your blog and really enjoy it, especially the fall decor and all of the wonderful neutral colors and textures!! It’s beautiful Beth! Can I ask where you got your rug? Thanks Mary! Rug is from Mohawk. I did a post on it a while back so you can search the archives for “Mohawk” if you need to know the name of it. Have no idea how you did it, but you did it! It’s all gorgeous, Beth! Very pretty Fall mantel! 🙂 Crushing on the scripted pumpkin on your coffee table. I love the scripted pumpkin as well where can it be found? The whole living looks so beautiful. I love all the different textures. Love the bark covered piece on the mantel. Love this scripted & velvet pumpkins! Where did you find them? Beth, it’s so nice to see pictures of your new home. It’s just beautiful. Thanks for sharing, busy mama. Beautiful-love the pillow! I love fall! This is lovely! I’m glad you had some time to do something you enjoy! Enjoy that little baby! First, Congratulations on your new bundle of joy! I think the last post I saw was your parents house set for a party. I love what you have done and the way you mixed your different elements together. It’s also the way I love to decorate. It’s kinda what I would describe as clean and rustic. The room and the surroundings has a soft and clean palette but accented with rustic flair. I’m sure your still adjusting to a new schedule, but I can’t wait to see more! Thanks so much, Cricket. I’m hoping to do more blogging soon when she’s sleeping longer stretches! So Pretty!! Love the way you decorated your mantel!! 3 hours well spent! looks lovely. i hope you are doing well! kiss that little baby bundle for me. Will do, Laura! Thanks so much! Oh Beth…I so love your mantel….So glad that the baby took a very long nap during the perfect light so we can enjoy your creations and your beautiful room decorated for Fall….Great to party with you and Happy Fall. And I love the last pic…well said. Have a great weekend! Love, love, love your fantel!!! If you have a chance, I’d love to know about the wreath! Did you make it or buy it? If you bought it, love to know from where! Can you tell, I need that wreath in my life!!! How do you do it all Beth? 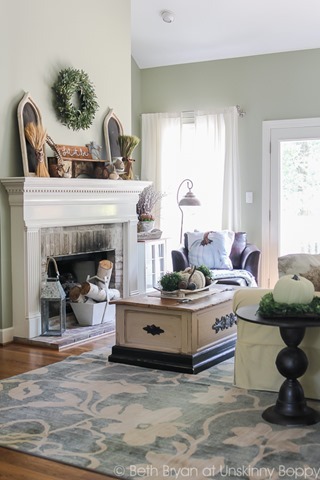 What a beautiful mantel and family room. My goodness your are a wealth of talent! Thanks so very much Yvonne! I don’t do it all, but when I do something I brag about it on the blog. LOL! Beth, I cracked up about all the baby stuff! Your mantel looks so good. Glad you had a break to get it done. Yeah that baby stuff will eat a house UP. It’s like a pink explosion in here. 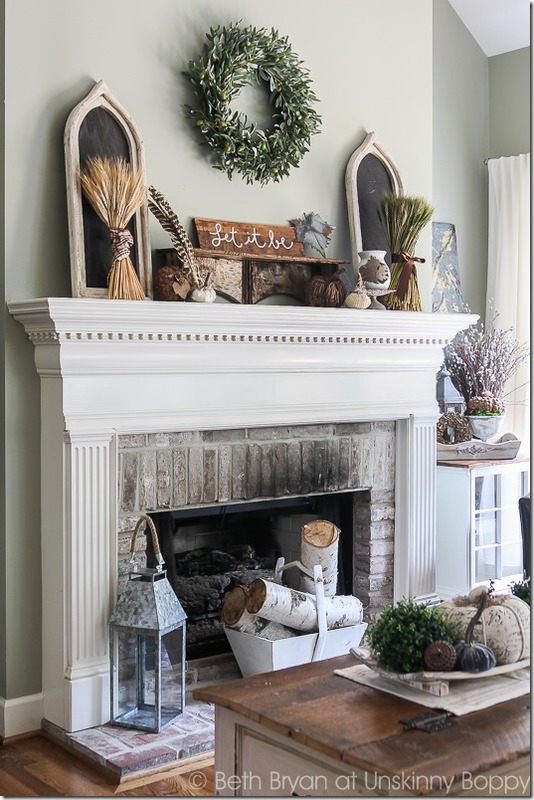 Mantel is beautiful, especially like the weathered piece over the small table to the right of mantel. Where ever did you find it? I got that at the Country Living Fair a few years ago from a vendor there. I still love it! 🙂 Thanks so much! 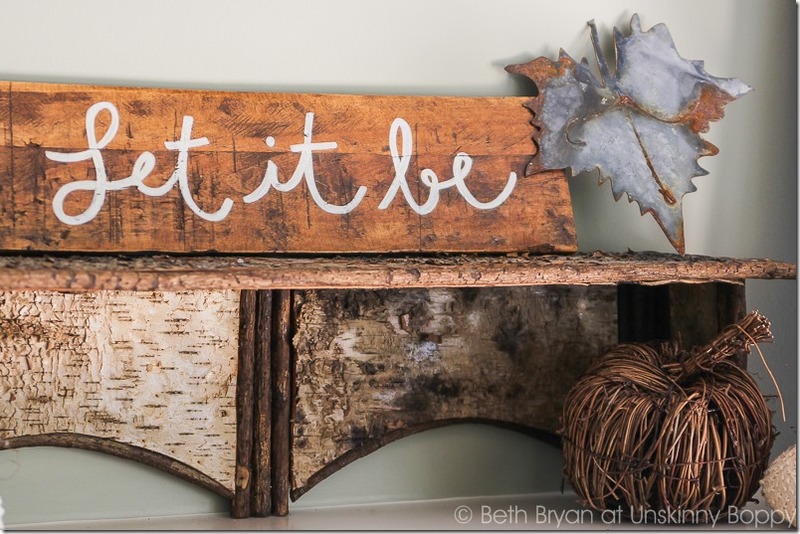 Beautiful fall decor Beth! Your new place is gorgeous! Entered the giveaway too! So glad you took the break to decorate bc you have talent!, So often in blogland, all we se is the craft section moved from the store into someone’s living room. 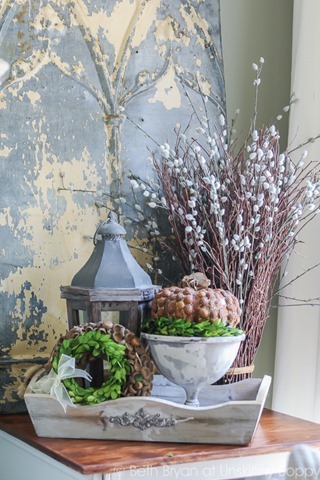 You add a whole concoction of old/new/earthy/seasonally appropriate items together for a glorious whole picture. Oh wow! Your comment has made my whole year. Thanks so very much for such sweet words. I call my style “flea market fancy” and I think you summed it up perfectly. I agree! 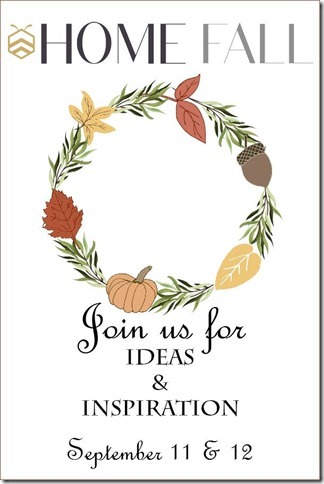 Lots of inspiration for us that are late to fall decorating party! Lovely autumn…so cozy and inviting! I love your mantle. I should get busy with mine. 2 questions. What is the wall color and where did you get the birch tree logs? Thanks!! Just found your blog for first time – which is kinda surprising – and just wanted to let you know that I love your mantle and beautiful home. And I especially loved imagining you sitting with your sweet little wee one feeding and you looking around “decorating” in your mind. Multi-tasking for the win, right? GL with everything. I shall be back and to read past posts too. You take gorgeous pics and I really ♥ your style. Oh, dear one. . .I love your voice. . .
” But for one glorious moment the heavens opened and the Autumnal Angels sang,”!!! I do believe those Autumnal Angles were right beside you when you orchestrated this lovely mantel!!! The overall tones of this entire color palette are serene and tranquil!!! I can only imagine the joy you take in gazing upon this mantel as you hold your precious baby in your arms!!! Thank you for sharing and inspiring, dear one!!! My goodness, Beth, my house doesn’t look half that good and I don’t have a newborn! Beautiful! I really love your decorating! 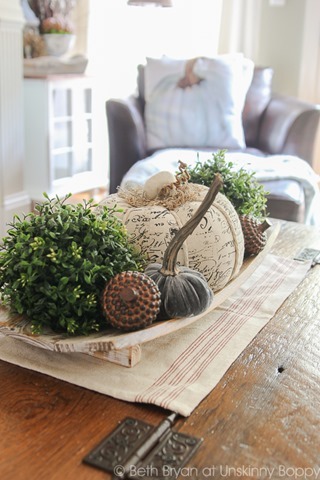 The tray w/ pumpkins and greenery on the coffee table table is my favorite. Could you list sources?thank you for sharing. Your home looks absolutely beautiful and perfect for fall, Beth. You are one super-awesome and talented Mama! You are very talented..love your blog. Just letting you know as I am sure there isn’t anything you can do about it. I wish I would have seen this to follow you sooner. You have a beautiful eye for decor. Thank you for sharing.